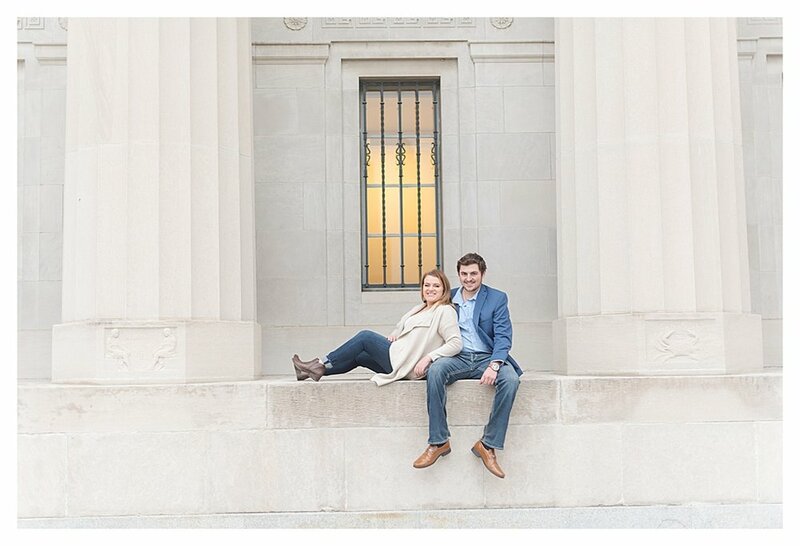 It’s always so fun when I have the privilege of shooting with a fellow photographer, especially when I get to shoot and an adorable couple’s session in downtown Indianapolis. Kaylee is the face behind Kaylee Creighton Photography, We have a very similar shooting and editing style, so it worked out perfectly for us to meet up and exchange sessions. I took photos of her, her boyfriend Levi, and their adorable golden doodle puppy, Sophie for their Christmas cards. I also took some head shots for Kaylee while we were there. In exchange, Kaylee took some photos of Andry and I, which I will share in my next blog post. The Central Library is one of my new favorite spots for sessions downtown. I started using this location when the construction at the War Memorial caused me to not be able to use that spot anymore, but I quickly became obsessed with the library’s gorgeous architecture. 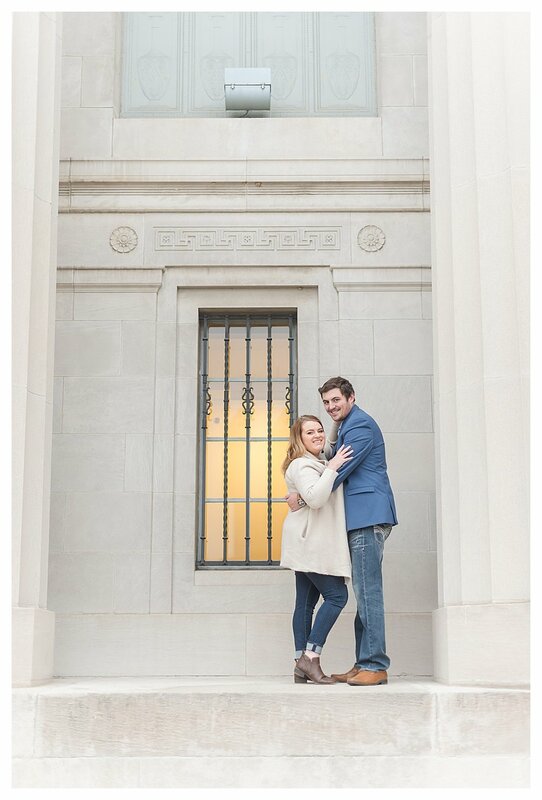 I always love to find clean backgrounds to bring more attention to the couple in the photo, and the library definitely provides that. I also love the warm glow that comes through the windows from the outside. Right across from the library is an open green area lined with sidewalks and trees. I almost couldn’t believe it when I showed up downtown, and realized that these trees still had beautiful fall colored leaves on them! Almost all of the trees in the city are bare by now, but I loved that there was still a little bit of fall left in downtown Indianapolis. Kaylee, Levi, and Sophie are just the cutest little family. I loved getting to work with them. 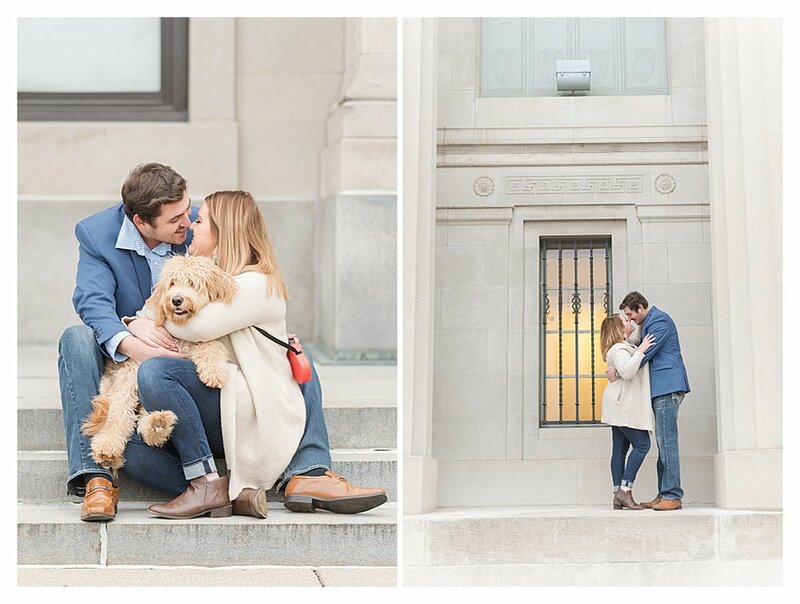 And I always love when couples bring their dogs to their session! Sophie is still a puppy, and she gets to excited, but we managed to get her looking at the camera for a few perfect shots. She did so well! I love all of the adorable photos that came from this session.